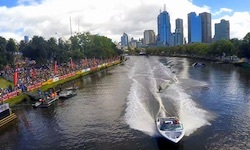 Melbourne, Victoria, AUS (March 3, 2017) -Staged over six days and nights on the Yarra River in Downtown Melbourne, this year’s first major international Waterski and Wakeboard Championships will once again set the pace for the rest of the 2017 season. Dating back to 1955, this 57th Moomba Masters will host over 200,000 fans on site at the spectacular riverbank arena in the shadow of the City’s skyscrapers. As part of the citywide Moomba Festival, over one million visitors will enjoy this long weekend Labour Day holiday. Few major international sports events attract such a high calibre of athlete every year. Eighteen countries will be represented. Included are World Slalom Champion Nate Smith (USA), World Jump Champions Ryan Dodd (CAN) and Jacinta Carroll (AUS), World Tricks Champion Anna Gay (USA) and World Overall Champion Adam Sedlmajer (CZE). In addition to this, there will be five Word Record Holders involved including Freddy Krueger (USA) and Whitney McClintock (CAN). For most Skiers, this will be their first major test following winter training. On the unpredictable Yarra River, anything can happen! With 15 species of native fish, it is surprisingly clean for a city site. Great credit is due to the City of Melbourne for their efforts. Last year, the Nautique Moomba Masters produced no less than six course records. Whitney McClintock and Will Asher (GBR) took the Slalom titles. McClintock set a new course record and Asher was forced in to a dramatic run-off with Nate Smith. In Tricks, the Women’s course record was exceeded four times. Anna Gay took that title and Aliaksei Zharnasek (BLR) the Men’s title. Finally in Jump, the hometown favourite World Champion Jacinta Carroll dominated once again, having set a course record in the Prelims. She has now captured 30 consecutive wins! In taking the Men’s Jump title, Bojan Schipner (GER) caused a sensation with the biggest title of his career. Apart from Zharnasek in Tricks, all these defending champions will return once again on March 8/13. 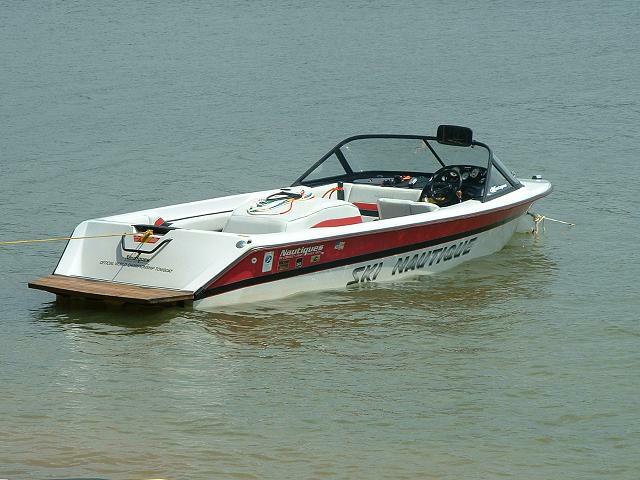 The Ski Nautique 200 boat, with its legendary pull and world-record setting flat wakes, will be used for all three Waterski events - Slalom, Tricks and Jump. Wakeboard Riders will use the Nautique G23. Nautique sponsors many of the top Waterski athletes at this event, including Nate Smith, Jason McClintock, Jonathan Travers, Ryan Dodd, Whitney McClintock, Clementine Lucine, Breanne Dodd, Anna Gay, Neilly Ross, Erika Lang, and Jacinta Carroll.